Our American readers may wonder why I am writing about this topic two months before the US celebrates their matriarchs, but here in Egypt, our big day is on March 21st. It could be interesting to research what countries have official mother’s and/or father’s day, but I don’t think I will get around to that anytime soon. If any readers have any insight, please share in our comment section! I have noticed this year that Mother’s Day is quite a big deal around here. I guess as our girls are getting older, and involved in more things, I will collect more and more handmade crafts of love from various venues. As such, I thought it worth writing about what I’ve noticed so far before first, I forget, or second, get too busy to write (being a mother and all). This is the first year Emma is in school, and she has been singing a few songs about mothers in both Arabic and English over the last couple weeks. Still, the day passed without any word of an assembly, so maybe it is still in the works? Sometimes it is hard to figure out the culture, especially when mixed with an Arabic administration! Emma also made a mother’s day surprise for me last Wednesday, but had to hide it in her backpack until yesterday when she presented it to me along with the flowers that she purchased with her sisters and Daddy – from her own allowance. The weekend before I scored four different mother’s day crafts! Fridays are both weekend and “church day” for us. 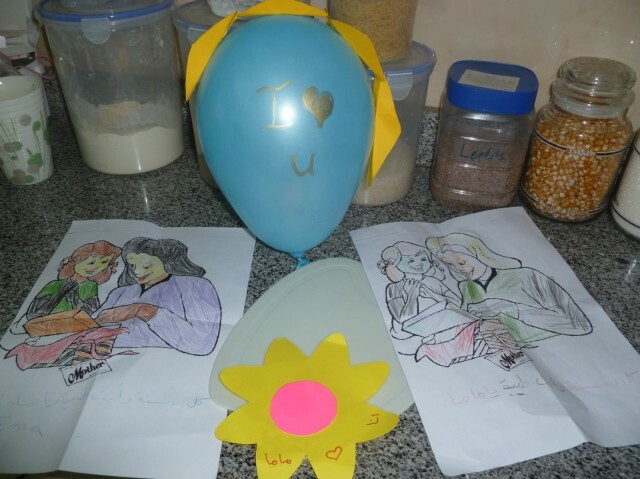 In the morning, the girls attended the Coptic Sunday School and each made a flower in their individual classes: Emma made a flower balloon, and Hannah made a paper flower to put on the refrigerator. At this same church, we will celebrate mother’s day in my adult Sunday school class tomorrow, and a friend mentioned that next Saturday night is a special service for moms, complete with gifts! That’s a lot of celebrating! Meanwhile, the second church where the girls attend Sunday School actually changed the time of their normal meeting today and invited the moms to attend a special party. And so the three girls and I headed over to the local Arabic Evangelical church where we first listened to the kids sing some of their normal songs. Then one of the teachers took some comments from the audience. First she asked the kids what are some things their parents do that really bother them. The answers included: Limiting internet, making me do homework and go to school, and yelling at me. And then it was the moms’ turn to share about the kids, which included: Not taking care of their stuff and not listening to their parents. During this time, Emma got out of her seat and came back to me to translate the question (in case I didn’t understand) and ask me to share an answer! Kind of funny that she wanted me to answer such a question. After it was all over, I asked what she would have shared if she said something. She liked the “Mom makes me do homework and go to school” comment. I was glad she identified with that first over some of the others! After the mutual sharing, the kids all went to their respective classrooms while the moms were invited to move forward in the sanctuary for a talk geared for them. The speaker shared that when she deals with kids, she emphasizes four things about them: They are important, loved, different and good. She then expanded each of these points, but since I had our two-year old with me, I wasn’t able to sit and concentrate on her talk. I caught some things here and there but missed the bulk of the message. Like I do! I was ashamed when I realized my superiority complex! It’s not that I think I parent perfectly, and I am willing to admit my faults, which are more on some days than others. However, I do think that I have studied how to parent well, even if I can’t always apply it properly. And this isn’t all pride. I have the privilege of great role models and friends who share struggles and ideas, as well as numerous books on the topic from so many perspectives. I almost don’t have an excuse for not having all the answers! On the other hand, I have lived in this part of the world long enough to at least know some of the stereotypical child-rearing strategies. And I am guilty of thinking all parents use these strategies. But we all tend to apply what we have learned growing up. Unless you really don’t like some things your parents did, and you have resources to find better ways, then you will probably repeat those things. I come from a place where resources are abundant and we are taught to search for ideas. That isn’t as true in this culture. Some of the things I observe here as adults relate to children have their roots in what people have been taught, and this stemming from good things. As I have mentioned in other posts (see below), Arabs, as a whole, love children. My kids have gotten so much attention from perfect strangers over the last 5 ½ years living in two different Arab countries, that I cannot doubt this culture’s love and care for children. One natural response here is that adults don’t like to see or hear children cry. If a child falls and scrapes his knee, the nearby adult will scoop him up, tell him, “It’s okay, don’t cry,” as he wipes the tears away, and then offer a lollipop or bag of chips to help him forget his pain. Remember as well that Arabs are generous. This continues along as a child gets into a fight with a friend or sibling and their feelings get hurt. A candybar helps to mend things. And then it gets carried further when a child gets upset because they can’t have what they want. If a two-year old is told not to touch the computer, and cries about it, they may be soothed by a bag of cookies. And so a young child may not be taught to deal with disappointment or learn to accept no for an answer. Instead, they may be placated with sweets. Sometimes my friends ask me how I discipline my children and they have often been surprised at how much I talk to my toddlers. I believe little ones can understand a lot at a young age, and we have explained our expectations to them from the start. I have noticed that younger children here are not expected to be able to listen and obey. At times my friends make fun of their own child-rearing practices as they explain that after telling a child no yet again and having that child disobey, then the parent will lose their temper and yell and maybe even hit their child. The parent’s anger has built up as the child disobeys time and time again, yet without real consequence, and then once the parent gets fed up, the child gets a punishment perhaps too harsh for the offense. Again, this is a stereotype, and certainly it is not only Egyptian parents who fit this scenario, but it is one that plays out time and again. There aren’t always resources to try something different. Well, I have strayed a bit from the title of the piece. After the question/answer time, we enjoyed a few snacks outside and the girls each brought me the pictures they colored of a mom and child. The church gave out small cutting boards to each mom and we walked back home to head to bed. It is nice, all this attention for Mother’s Day. Another friend invited some moms to her place for tea on Mother’s Day morning, and that was nice too. Perhaps there will still be an unknown school assembly to come! I know I have a most privileged job here as a mom to our three girls. Today I was reminded that I don’t have all the answers, and as parents we do the best with what we know. I am always praying that God would make up the slack and give me more wisdom than I possess on my own! Update: Now that it is Mother’s Day night, I can finish this post with a learning experience. When I dropped Emma off at school this morning, I kind of noticed half-heartedly that other moms and kids were coming to school with gifts. I barely thought about it until later that morning when another foreigner was asking if Emma had taken a gift to school for her teacher. Then it occurred to me that the other parents were doing just that! I wondered why, since many of the teachers weren’t actually moms, but I tried to find a quick suitable gift for Emma’s teachers before picking her up for the day. I stopped at the local sweet shop and bought some chocolate after asking the workers there if this was an appropriate gift. I was so glad I decided to stop and get something even though it was a last-minute thought. Emma was so happy to give a gift to her teachers and glad to be doing what the other kids did. A nice tradition, to give teachers gifts on mother’s day. Let’s hope I remember by this time next year. In the brief time I was with you, I was really impressed with your parenting. I loved how you talked to your kids, explaining things, all in a calm voice. And you were consistent. The kids understood the rules. You can be humbly proud of your mothering! Very interesting post. We lived in Egypt for 7 years while our kids were little, had 2 born at Nile Badrawi! I’ve read some of your husbands post before and this one was a fun one to read from you. I received a Happy Mother’s Day from our daughter who lives downtown Cairo – always feel like I get to celebrate twice! It totally get the cross-cultural disconnect in parenting. I grew up in Pakistan so was not unprepared. Loved how Egyptians loved and valued our kids….but going out to eat with friends at 10pm didn’t work very well.